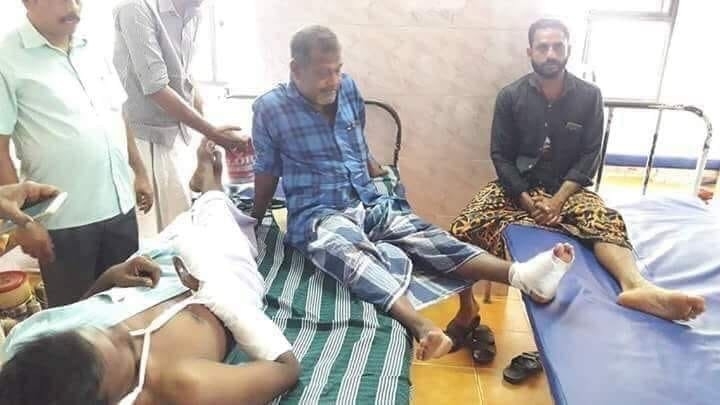 On June 28, Jalal, a cattle trader, resident of Kottarakkara was returning from cattle market in Charummoodu, when two people attacked him, his relative Jaleel and driver Sabu at the Muslim street with sticks, leaving them severely injured. They have been hospitalised in Kottarakkara's Taluk hospital. peaking to Newsclick, Jalal said, "We were coming from Charummoodu cattle market along with cattle and heading towards our hometown Kottarakkara. Suddenly we noticed that two people were following our vehicle by bike. When we reached Muslim street they stopped our vehicle and started arguing about where we are taking this cattle to and started manhandling us." Jalal further added that he was bringing the cattle to sell in his hometown but these (RSS) people argued with them, saying that cow-dung was flung on their face, which was a false allegation. The Kerala police have arrested two RSS workers, Vishnu and Gopakumar in this regard and have charged them with an attempt to murder and many other charges. The assailants were from Puthoor, 26 kilometres from Kollam District. CPI(M) leader Viswanathan told Newsclick that such incidents have become very common across the country but “we will not let this happen in our state. The police have arrested two RSS people in this incident. Various students wings, including the CPI(M), are protesting against the incident across the state against these RSS goons”.